Every 33 seconds, a child in the United States is involved in a car crash. That’s a scary statistic. Worse yet, more than a third of kids who died in crashes were completely unrestrained: no car seat, no seat belt, nothing. To help parents and the people they entrust to take care of their kids and get answers to their car seat questions, Safe Kids Worldwide created the Ultimate Car Seat Guide. It’s a way to address the basics and provide parents with expert advice as they protect their children at every stage and every age in cars. The Ultimate Car Seat Guide was created with support from General Motors to give parents helpful information on how to choose and use a car seat. It also offers parent-friendly tips on how to fit and test a child’s harness, and test whether the car seat is installed tightly enough in the car. Finally, they will learn tips on when it is time to move to a new type of seat. There are two ways to get information. First, a parent or caregiver can enter the name, birthdate and weight of a child. This will produce a set of five tips carefully chosen to meet the needs of that child. They can also learn basic tips to address buying, installing, fitting or when to change to a different car seat. All information is based on science and expert- provided best practices; things we have learned through millions of one-on-one car seat inspections that provide the best safety information. 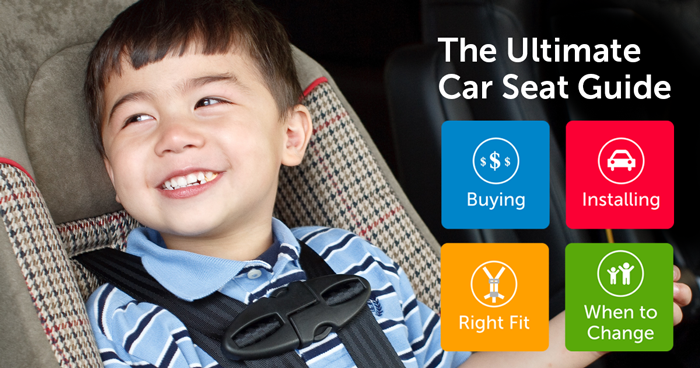 According to NHTSA 59 percent of car seats are not installed correctly. If a parent or caregiver wants to check to make sure their car seat is installed correctly, they can attend an event hosted by Safe Kids coalitions across the country. Certified Child Passenger Safety Technicians will guide parents on proper car seat and booster seat installation. To find an event, click here. Safe Kids wants to extend a huge thank you to the people who helped review the Ultimate Car Seat Guide. We could not have done this without help from parents and safety professionals who tested, reviewed and suggested improvements to make this a tool parents and caregivers could use easily and share. Families helped us know what they need and want in a guide like this. Parents need not worry that their child’s information will live on the internet. When they are finished with the Guide, they alone decide whether to share the information. Many professional safety advocates served as reviewers as well. We appreciated their honesty and expertise. We carefully considered every suggestion and worked to select those that provided the most clarity in a form that resonated with parents. While not every suggestions was accepted exactly as offered, we think most of them will be pleased with the way their colleagues helped frame the tips, glossary, frequently asked questions and the guide itself. Their names are listed below. We tried to make everyone happy; not easy to do with such a serious topic! It is our hope that children everywhere will benefit from this Guide as their parents and caregivers make decisions about their safety every day, either in their own cars or in a carpool. I hope you will remember to make every kid a safe kid every day.